Guthrie set or tied seven school records at Florida State and scored a total of 156 points. 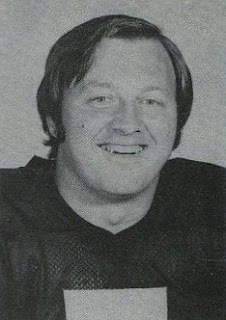 He was chosen by the Buffalo Bills in the sixth round of the 1970 NFL draft and was successful on 10 of 19 field goal attempts, including one from 52 yards that was a club record at the time, and 24 of 25 PATs as a rookie. But after connecting on just three of ten field goal tries in ’71, Guthrie failed to last beyond six games. He unsuccessfully attempted to catch on with the Jets in 1972 and joined the Sharks of the new WFL in ’74. When the franchise folded after 14 games, he moved on to Birmingham. Sharks went 4-10, failing to last the season, to finish fourth in the WFL Eastern Division. Guthrie was signed by the Los Angeles Rams in 1975 but didn’t make it to the regular season. In his stints in the NFL and WFL, he kicked a total of 31 field goals and 34 extra points (all with the Bills as the WFL’s equivalent, the action point, could not be kicked) for a total of 125 points. Guthrie was inducted into the Delaware Sports Hall of Fame in 1987.